Vanesa and Stephanie were matched over two years ago. Vanesa was only six years old when she first met her Big Sister Stephanie. We paired Vanesa and Stephanie together because Stephanie wanted to provide Vanesa with a mentoring relationship like the ones she had when she was a child. Stephanie had teachers and her mother’s best friends, who she spent time with her and did activities that her parents weren’t able to provide her. She wanted to provide her Little with experiences where she could learn and expand her creativity. Vanesa comes from a Hispanic family, lives with both parents, but they work long hours. After their jobs, her parents are left with little time to spend quality time with each child. Her mother enrolled her in the program in hopes that the Big Sister would be able to expand Vanesa’s perspective and motivate her about her education. Vanesa and Stephanie hit it off right from the start. On their first outing, Vanesa was a little shy and quiet, but by the end of the outing she opened up and was chatty and outgoing. They meet every Wednesday, since they were matched. They do things like bake, go to the park, go grocery shopping, arts and crafts for special holidays, and Vanesa’s favorite, learning how to make slime. Vanesa loves learning. She has been able to see, learn, and explore more with her Big Sister. One of the places they both enjoy going to is the Children’s Museum. Vanesa loves to go there with her Big Sister. They visit almost once a month. This was a place that Vanesa had not been to before meeting Stephanie, and wouldn’t have otherwise visited. Vanesa loves playing in the “play pretend” area where they get to practice her math by pretending that she runs the cashier register. This has helped Vanesa feel more confident in her math class. Vanesa now says she loves math! Stephanie has participated in public speaking for our program, sharing her story about being a Big Sister. Stephanie and Vanesa have supported our events by helping with our community outreach events. Vanesa and her mother have shared their experience with others in their community motivating parents to have their children participate in the program. 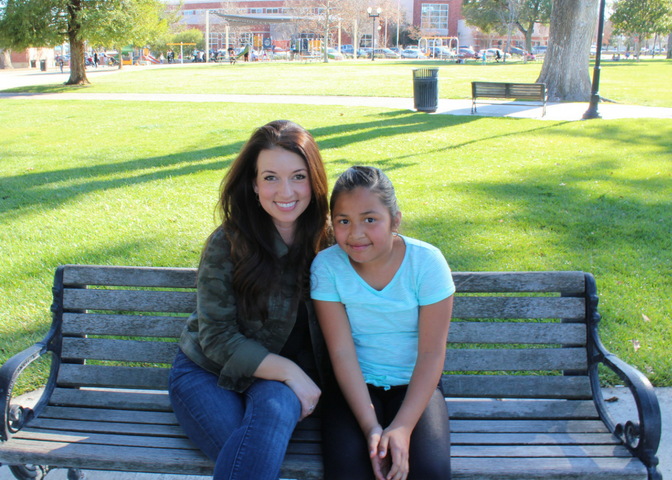 Vanesa used to struggle with school, she would share with her Big that she disliked school. Her Big Sister helped her find the things that she did like and focus on the positive things. Stephanie has helped Vanesa improve her reading. Occasionally for their outings they would go to the library. While they visited the library, Vanesa and Stephanie would pretend that Vanesa was a teacher. During the time, Vanesa would read to Stephanie. Vanesa enjoys reading now, because Stephanie made it fun. Another thing Vanesa has found she loves is recess. Stephanie has three children who also attend the same school as Vanesa. Before Vanesa and Stephanie became a match, Vanesa didn’t know Stephanie’s children. Stephanie shared that the children in the school play during recess with those children that look most similar to them. After being matched with Stephanie, Vanesa has had a chance to interact with Stephanie’s children and they are now friends. They play in the playground together and more children have started to play together as well. They have started to break down the culture division that existed before.